How to describe “Pod” ? An experimental short film with hysteria as a central theme? Or is the author trying to visualize a personal nightmare? Looking back, it wasn’t really an exciting film . And personally, I think the used argument that it’s reminiscent of the best of the X-Files is a little exaggerated. The episodes of the X-files at least had a decent storyline. 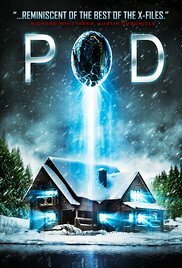 “Pod” is a simple linear story without significant highlights and a total lack of explanation. The film’s pace is the same as the credits in the beginning. Reading all the names was practically impossible. But perhaps that was intentionally. The complete story can be summarized easily since the content is really brief. Everything starts after an alarming phone call from Martin (Brian Morvant) to his brother Ed (Dean Cates). Martin is an ex-marine suffering from PTSD (I assume anyway) who’s dumped in the family cottage. Ed begs his sister Lyla (Lauren Ashley Carter) to go to the cottage and check on Martin and see if his condition is really worsened. Once there, they find Martin as mad as a hatter, telling a confusing story about secret experiments and disappearances during military missions. He claims that he trapped something called a “Pod”. He was able to overpower it and lock it in the basement. Is it reality or a chimera playing tricks on Martin because of his paranoid phase? Looking at the state Martin is in, manic and confused, you can only conclude that he’s ready again to be taken to the nearest madhouse in a straitjacket. But to be honest, his brother and sister don’t seem to be mentally stable either. Lyla has or gets an alcohol problem. She’ll react in a hysterical way very quickly and immediately she believes the story of Martin. So get ready for some continuous hysterical screaming and wailing. Also the relationship with her brother Ed is not really that great, which leads to constant bickering between the two of them. Ed is a control freak (that’s probably why he’s a psychiatrist) and doesn’t believe in the hallucinatory story. Logically, he’s the one entering bravely the cellar to prove that it’s all poppycock. Does the film have anything to offer? In short, nothing really. In terms of performances only that of Brian Morvant is commendable. He’s very convincing as the lunatic brother. Cates and Carter are simply irritating. As a short film it has its charms and technical it looks, even with a limited budget, not so bad at all (nice shots at times). But as a film it’s inadequate in many ways. The cabin-in-the-woods theme isn’t exactly original anymore. Though there’s a paranoid and claustrophobic atmosphere in the house thats covered with aluminum. And it all feels pretty chaotic. But you can’t call this really horror. And which relationship there is with the X-files, I can only guess. Furthermore, the creature looks awful. The rare moments you’ll catch a glimpse of it, the screen becomes all blurry and shaky. The moment Larry Fessenden appears, the story takes a different turn. Don’t expect much explanations or insights. It all remains fairly vague. And it all ends with a very predictable scare moment. Before you know it, you’re watching the end credits. Maybe the story is explained furthermore in Pod II.